The next generation in macular pigment measurement is here. Redefining the approach to age-related eye healthAccurately measuring over 4 million eyes since 2006, the QuantifEye MPS II applies advanced technology and an intuitive interface for comfortable and accurate macular pigment optical density (MPOD) measurement. Take patient care to the next level. MPOD measurement allows eye care professionals to assess a key age-related eye health risk factor, low macular pigment, as well as other visual performance challenges. The QuantifEye® gives patients a score between 0 (low) and 1 (high) for their macular pigment density. Unfortunately, 78% of the population has suboptimal MPOD scores, but these scores can be improved through nutritional supplementation. Low MPOD is a key risk factor for age-related eye health complications. Healthy MPOD blocks harmful blue light from reaching the visual cells in the back of the eye. MPOD is associated with visual performance benefits like glare, bright light, and night driving. A proactive way to offer your patients the best medical care and value without discounting services and products. A way to learn important information about a patient’s macular health, serving as a biomarker for age-related eye health and other visual performance challenges. A sense of empowerment to patients because rather than focusing on treatment, you’re educating patients and helping them to be proactive. A chance to gain trust with your existing patients who now spend more money with you and ultimately send you more referrals. An opportunity to distinguish your practice and add a valuable revenue stream. Data Quality Index (DQI) featuring a Green/Yellow/Red scale informs technicians when to Accept, Accept With Caution or Reject a graph. Icon-driven menus enable quick access to all features, getting you faster through the lane. Number of purchase options 3 ? “I was a very early adopter of QuantifEye MPOD measurement in my practice. I quickly realized that MPOD testing is a very valuable, if not critical, clinical tool for not only detecting low levels of macular pigment density, but identifying the population at risk for AMD and giving the clinician the ability to follow the progress of treatment plans”. "Our relationship with ZeaVision has been one of our best vendor partnerships. Their trainers installed the QuantifEye MPOD instrument and EyePromise supplements and provided exceptional training for our staff. Our patients, doctors, and staff are very enthusiastic about the new technology. The program was easy to implement, provides enhanced patient care, and is making our practice more profitable. Our monthly MPOD testing and supplement profit has averaged $4,000 since implementation." "The QuantifEye instrument and EyePromise supplements have enabled us to make a significant, measurable impact on our dry macular degeneration patients’ quality of vision, and has helped us identify those who may be at risk for macular degeneration. Measuring macular pigment is one of the most useful and important tests we perform. Hearing first hand from our patients how treating their low macular pigment has improved their quality of life is very rewarding." 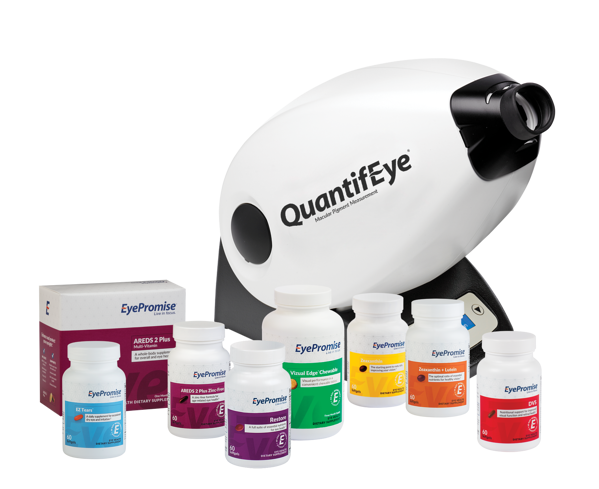 The QuantifEye® Program is trusted as the industry-standard turnkey program for measuring Macular Pigment Optical Density (MPOD) and nutraceutical vision support. In addition to national eye health studies, we sponsor research with leading university science programs across the country. With research and testing behind the effectiveness of our products, you can be confident that your patients will see results with EyePromise. As part of the EyePromise QuantifEye Program, you can try the QuantifEye MPS II in your practice for 60-days, risk-free. Additionally, the QuantifEye can be purchased or leased, and EyePromise offers several options and programs to suit all types of practices. Get special introductory pricing on new systems and upgrades. Purchase and leasing options available. To learn more about macular pigment measurement or to schedule a 60-day trial, please complete the following form. Our regional accounts managers are standing by to assist you.